Our last day together was spent with 2 families who had kindly agreed to share their story. I felt this was an incredibly brave thing to do. Think about it: sit in front of a 40+ people you don’t know and answer intimate questions about your family in a foreign language from a therapist you’ve only recently met. Leave, and hope that you hear something that furthers your understanding of why things might be the way they are. That’s a pretty tall order by anybody’s standards and deserves recognition as well as our thanks. We listened as Dan politely questioned each family member about their experience and relationship with a family member exhibiting symptoms consistent with ‘Adult Entitled Dependence’ (AED). In the absence of the patient, the ‘client’ became the individual family members. The goal of the intervention? To gain a small insight in to the patterns of mutually reinforcing thoughts, behavior and emotions that make up familial ‘Accommodation’ and adult-child ‘Dependence’. Yesterday, Dan acknowledged that this type of work can only be undertaken carefully and considerately by a team working towards a consensus that ameliorates risk. Undermining the interlocking architecture of Accommodation and Dependence is emotionally, psychologically and physically risky for the adults involved but one which the principles and practice of NVR are entirely appropriate. Recognising and accepting the feelings of helplessness brought about by Adult Entitled Dependence is an important first step for the families of adult children. Dan drew parallels between this stage and that faced by parents of children with challenging or self-destructive behavior when they recognise they are invisible to their off-spring (so-called ‘erasure’). 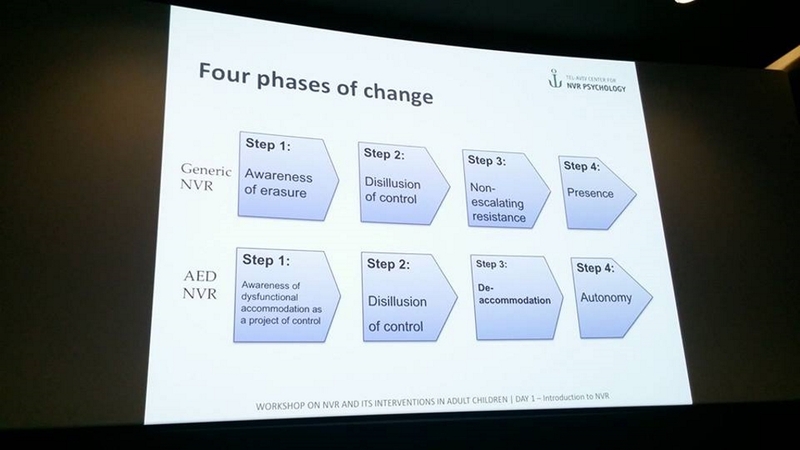 In both models, parents come to accept that that they cannot control their child’s behavior (the ‘disillusion of control’) only their response to it. Relinquishing control enables parents of adult-children learning to ‘de-accommodate’ their child in much the same way that parents living with disruptive behavior learn to practice non-escalatory resistance by politely persevering (‘you don’t have to win’), asking for help from supporters and practicing ‘relationship gestures’. In this way, the families of adult children work towards the goal of ‘parental autonomy’ like those dealing with aggression strive to raise their ‘parental presence’. the importance of respectfully supporting parents through the painful realisation that their thoughts, emotions and behaviour are intimately associated with their child’s dysfunctional behaviour. the validity of Haim Omer’s observation that letting go of the need to control your child whilst initially disappointing is ultimately liberating. Time to catch that train!